How do you think mature forests, such as the temperate rainforests of coastal British Columbia, change over time? Your predictions should be recorded in your individual Google document, Sustaining Earth's Ecosystems – How Change Occurs Naturally. Once you have finished your brainstorming you should move on to Time to Research portion of this activity. While you are reading the notes below and watching the videos, you should be making notes in your individual Google Document, Sustaining Earth's Ecosystems – Personal Notes, if you prefer you can record your "personal notes" on paper. When an organism is born, it belongs to a species, but it also is born with unique characteristics. Sometimes, these unique characteristics give organisms an advantage within their niche. For example, a salmon with a slightly larger tail may be able to swim a little faster or a little farther in a river. Natural selection is the process where individuals with advantages are better able to reproduce and pass along their traits. Those with unfavourable characteristics have less chance to reproduce and pass along their traits. A salmon with a smaller tail may never have a chance to spawn because it cannot swim to the correct location. The Galapagos Islands, off the coast of Ecuador, are a famous example of natural selection. Many species on these islands are very similar to each other but different from species on the South American continent. There are 13 species of finches on the islands. Each is descended from a finch species from the mainland. Each species has unique characteristics that allow it to thrive in its own niche and not compete with other finches for resources. Adaptive radiation describes the type of natural selection where many different species appear from one original species. Ecological succession refers to the changes in the biotic characteristics in an area over time. There are two types of ecological succession: primary succession and secondary succession. Primary succession begins with bare rock such as where glaciers scrape away dirt or a volcano erupts. Wind carries spores of lichens and organisms that can survive and eventually, combined with the weathering of rock, help form soil. The first organisms to survive and reproduce are pioneer species. Pioneer species alter the abiotic and biotic environment in some way. Soil improves, plants are able to grow and animals begin to appear. Primary succession occurs in all parts of the world. Mature communities are very stable and can appear to be unchanging over long periods of time. These are also known as climax communities, but “mature” correctly implies that there are still changes occurring. 2. Secondary succession occurs after a major disturbance in an area that already has soil and once had living organisms. Forest fires are the most common reason for secondary succession. The soil remains for plant growth and contains seeds, micro-organisms, earthworms, and insects. Secondary succession is much more rapid than primary succession because soil, seeds and insects are already present. ​Many other disturbances can affect mature communities. ​Water is not contained within natural or artificial barriers. Floods generally occur in locations where water levels can change rapidly. Flooding can result in soil erosion as well as the spread of pollutants and harmful bacteria associated with wastes. Climate change and global warming may be increasing incidents of flooding. A tsunami occurs when huge waves from large earthquakes or volcanic eruptions flood coastal areas. (NASA Earth Observatory. 2011. 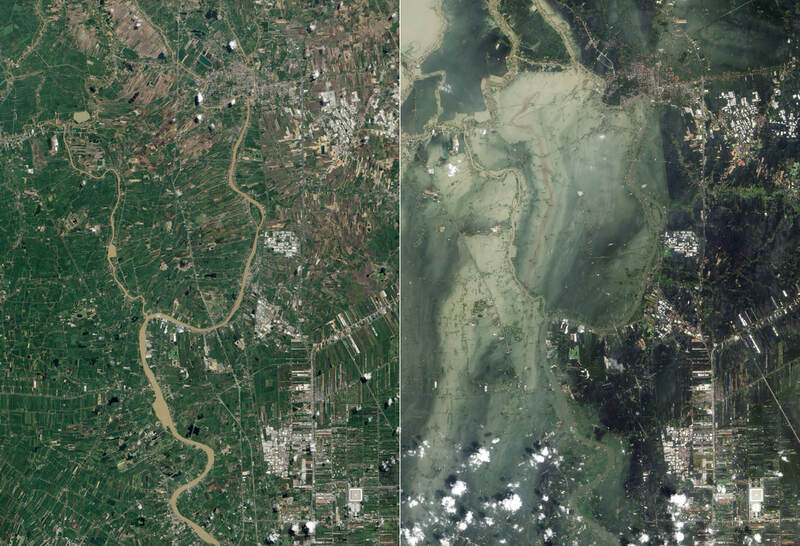 Flooding in Ayutthaya and Pathum Thani Provinces in October (right), compared to before the flooding in July (left)). Drought occurs when an area receives a lower than average amount of rainfall over a long period of time. Prolonged drought can have severe effects on organisms. Many insects play important roles in their ecosystems. Even insects that appear destructive, such as the mountain pine beetle, actually play a role in the renewal of the forest. The beetles have a symbiotic relationship with a species of fungus that inhibits the trees’ ability to use resin for protection. However, when normal conditions are changed, infestations can occur. Trees can be stressed from overcrowding drought or animal grazing and do not resist the insects as effectively. A warmer climate and lack of forest fires allows the insects to spread much more effectively than in the past. Not only are the trees affected, but so is the entire forest ecosystem, as well as any human industries relying on the forest. Take the time to answer the following questions; record your answers in Sustaining Earth's Ecosystems - How Change Occurs Naturally. (You should be able to answer the following questions without having to refer to your notes). The concept of natural selection, is a process in nature that is based on what theory? Who first introduced this theory? What is a mature community? After a forest fire, not much is left except for ash and burnt trees. Describe the sequence of events that will occur during secondary succession. ​​Take time to complete the activity Adaptations to Aquatic Environments, as outlined in your seperate GoogleDocument. Let's have a check-in. Reflect on what you have learned in completing these activities. Write an overall summary of what you have learned in 2-3 sentences. Share those thoughts on the PadletWall above. Return to "Ecosystems Continually Change Over Time"
Proceed to "Activity: How Humans Influence Ecosystems"